Mix bitter gourd and salt and set aside for half an hour. After half an hour, place bitter gourd in a sieve and press out all excess liquid. In a pan, heat oil. 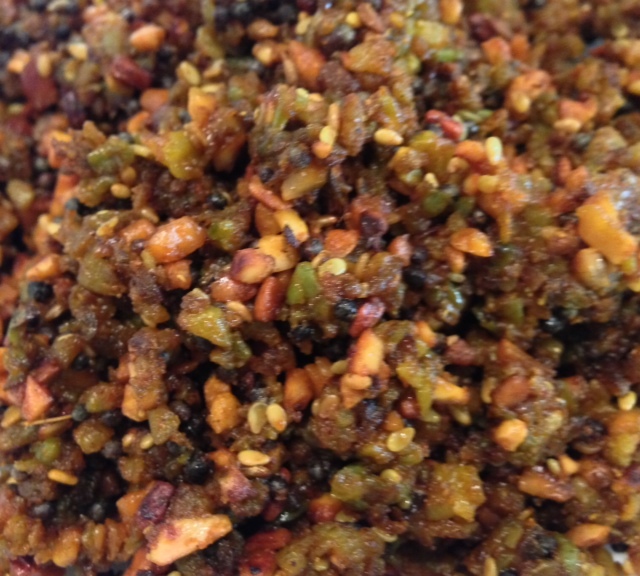 Add mustard seeds and cumin seeds, once they pop, add fenugreek seeds and sesame seeds. Once sesame seeds start to pop, add peanuts and fry until golden brown. Add bitter gourd, coriander powder, red chili powder and turmeric. Add water and cover pot. Cook until bitter gourd has cooked through. Remove lid and keep stirring and frying until the mixture darkens and dries out. Sprinkle amchur and stir well. Serve with hot rice – Enjoy!